In a recent post to the American Association of School Librarians (AASL) Forum, Dr. David Loertscher pointed us to a Mindshift blog post by Tina Barseghian. Her piece focused on measuring deeper learning. On the AASL Forum, David asked how school librarians are shifting their practices, particularly in Common Core State Standards learning experiences, “to concentrate on deeper learning rather than the old superficial factual knowledge acquisition that has been commonplace.” He also asked what school library educators are doing to teach this shift in preservice preparation courses. To answer David’s questions, I would like share my New Year’s resolutions. I will continue to work with the school, public, and academic librarians in Denton, Texas as we inquire about how to best support young people in our community in developing lifelong literacy skills through deep learning. As a first step in the 2012-2013 academic year, the Denton Inquiry 4 Lifelong Learning team is facilitating a year-long book study of Drs. Carol Kuhlthau, Leslie Maniotes, and Ann Caspari’s book Guided Inquiry Design: A Framework for Your School (Libraries Unlimited, 2012). In my work as a school librarian educator, I will continue to push the preservice candidates with whom I am privileged to learn toward facilitating inquiry learning and technology integration through classroom-library instructional partnerships that position librarians as leaders in “deeper learning” reform efforts in their schools. Whenever the opportunity arises, I will write letters to the editors of the newspapers in my communities to inform readers of the potential of professional school librarians to positively impact 21st-century students’ learning and teachers’ teaching. And I will continue to coproduce this blog with my colleagues Drs. Sue Kimmel, Melissa P. Johnston, and Judy Kaplan to share news and views to further conversations with our preservice librarian candidates and practicing librarians regarding our role in building cultures of collaboration in our schools. As a practicing school librarian or school librarian educator, how will you resolve to improve the practice of our profession in 2013? Barseghian, Tina. (2012, Sept. 13). How do we define and measure deeper learning? Mindshift Blog. 31 Dec. 2012. For the past few months, our joint blog has highlighted the importance of collaboration for teacher librarians in schools. Collaboration, defined in many ways and present in various manifestations, frames the TL role as an instructional partner with classroom teachers and other learning specialists to improve students’ learning. We need to keep current with pedagogy and technology, so we can talk the talk and walk the walk. Collaboration provides a path for leading from the middle, and sharing responsibilities for decision making and teaching. All of this sounds very professional, antiseptic, and laden with educational jargon, at times. At the true heart of collaboration are the personal relationships that are built on trust and respect, as we work together to create new learning opportunities for kids. We want to make a difference together, not alone. Collaboration leads to friendships, built on common interests, either about content or with concern for the struggles of individual students. With new partners or continuing partners, we share the day to day joys and challenges of people who really care about kids and education. We become a family, a community with deep bonds. When I think about collaboration, I think about my teacher friends, and so when I heard the reports about the shooting in Connecticut, I despaired for the lost lives and the lost friendships, something of which I experienced first-hand several years ago. I have been trying to wrap my mind around the compelling event at Sandy Hook. How can we make sense of carnage in elementary classrooms where bright smiling faces of eager students are struck down in a blizzard of bullets? Those of us who have experienced the joy of teaching and learning along with our students are shaken to see other teachers and administrators killed in the line of duty. That phrase is usually heard about police officers, or fire or military personnel, but as educational community members we have to help kids be safe, and sometimes the reality is overwhelming. How do we reassure our students and ourselves that the school is a safe haven from an often unstable world? How do we return to that sense of normalcy that helps everyone move forward once again? When I heard of the unspeakable tragedy unfolding in Connecticut, I was immediately taken back to a day in August 2006. Teachers in my school district were spending a typical in-service day, in meetings and preparing classrooms for the new school year. There was excitement and anticipation in the air. Stories were being shared about the summer, and ideas for new projects were being presented as reinvigorated teachers swapped ideas. Suddenly, the principal came over the intercom and told us to proceed to the cafeteria, we were being locked down. Then the bad news came crashing in, there had been a shooting at the other elementary school, a mile away. And it was devastating to our community. A domestic dispute boiled over into the school and two of our colleagues, our friends, were shot, one fatally. Who could imagine that? What would have happened if it had been a regular school day? The next few weeks were a blur, a community reeling from pain and suffering, but coming together to share and support one another to get through one day at a time. For the teachers, the concern was not just for our pain, but how to make our students feel safe, and to bring hopeful happiness back into the schools. Concentrating on the kids, and helping each other as the days went by, eased the loss a bit, but that day changed us all forever. The point I would like to make here is that the connections forged in the classrooms and in the schools, between educators, administrators, parents and community members provide the glue that holds a community together in the good times and in the bad times, too. Right now, the horrific situation in Sandy Hook has cast a somber shadow over the holiday season across the country. That community will never be the same, but time and dedicated educators, parents, and community members will collaborate to find a path for the survivors to reclaim their schools, and rethink safety for all, so that students and teachers can get back to the business of learning-the best business of all! As I finish up the semester I have been thinking about my student’s reflections on collaboration. One of the things that really stood out for me was the focus on how we now collaborate. I think now more than ever, technology and the tools it provides for online collaboration are reshaping collaboration for school librarians. I model using these tools in my courses for students in the hopes they will then see the value and how they can then utilize them in their own practice. The challenges that most of us experience such as teachers saying they don’t have time to collaborate or that on a fixed schedule there is no way. Online collaboration tools allow for everyone to contribute on their own schedule and when they do have the time. Also these tools mean that more people can be involved in collaboration without the worry of coordinating everyone’s schedule. Finally, geography is not a limitation. It is possible to collaborate with professionals all over the world, even if that person may just be down the hallway. Online collaboration tools also have also changed the way that we work with and teach students,as well as the way that students work with each other. 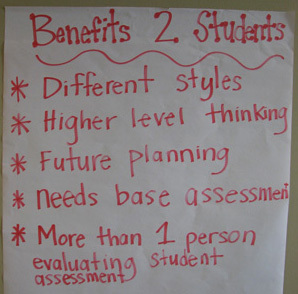 Students have increased opportunities to collaborate, in an engaging way, and learn valuable technical skills as well. This was just noted in an article I read a couple of weeks ago – What’s Changing in education? For this Tech Tool Expert. It’s Collaboration. As stated in the AASL Standards for the 21st-Century Learner (2007) Common Beliefs: “Learning has a social context. Learning is enhanced by opportunities to share and learn with others. Students need to develop skills in sharing knowledge and learning with others, both in face-to-face situations and through technology.” I ask my students all the time to look back on these Common Beliefs and think – how am I reflecting these in my school library program? How are you using technology to encourage sharing and facilitate collaboration in your library program? While observing the one-hour workshop cooperation and a collaboration planning session role play, the preservice principals in the TWU Professional Development and Supervision course identified the items (on the post-it pictured) as benefits to students. The principals noticed that students would benefit from instruction provided by two (or more) educators with different teaching styles. When the preservice principals shared this bullet, they also talked about how the instruction that was planned addressed students’ various learning styles as well. They noticed that through collaboration the educators pushed the instruction to a higher level. Critical thinking was a focus of the lesson/unit planned. The collaborative planning session revised a previously taught Civil War unit that focused on heroes and battles (what David Loertscher calls a “bird unit”) and involved students in an inquiry process in which they would develop personally-meaningful questions about the war. Targeted assessment and shared responsibility for assessing the learning outcomes were also important to these preservice principals. School librarians can excel in gathering locally-generated formative assessment data to demonstrate the impact of instruction on student learning outcomes. This aspect of evidence-based practice is essential in today’s learning and teaching environment. I want to thank the students in Dr. Starrett’s ELDR 5223 Professional Development and Supervision Fall ’12 class for allowing me to share the “library story” and for sharing their insights with me/us. Loertscher, David V., Carol Koechlin, and Sandy Zwaan. Beyond Bird Units: Thinking and Understanding in Information-Rich and Technology-Rich Environments. Salt Lake City: Hi Willow Research and Publishing, 2008. Collaborative planning is another form of job-embedded professional development. In the one-hour workshop after observing cooperation and a collaboration planning session role play, the preservice principals in the TWU Professional Development and Supervision course identified the items (on the post-it pictured) as benefits to educators. While this confirms to me that these practicing classroom teachers value the school librarian’s expertise as a resource provider, I noticed that building relationships appears on this group’s list as well as on the benefits-to-principals list. I believe that school leaders are more and more aware of the importance of nurturing a positive school climate. Educators who support the principal in that effort, school librarians included, are especially valuable members of the learning community. 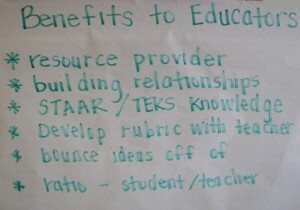 STAAR (Texas standardized achievement test) and TEKS (Texas state standards) were third on their list. Of course, school librarians and classroom teachers with deep knowledge of curriculum and how it’s tested are important to these preservice principals. Administrators feel the pressure for addressing standards and improving test scores. They could see in the role play that an interdisciplinary approach allowed the educators to cover more ground while students experienced deeper learning experiences. As instructional partners, the work of school librarians is integrated into the academic program of the school, increasing their potential to affect student achievement significantly. However, when school librarians are asked whom they serve “most would answer students, yet the primary clientele in terms of power, impact, and effect would be teachers” (Haycock, 2010, p. 3). If you are a school librarian, if asked, what would your classroom teacher colleagues say is your greatest contribution to the learning community in your school and how do teachers benefit from coplanning and coteaching with you? Haycock, K. (2010). Leadership from the middle: Building influence for change. In S. Coatney (Ed. ), The many faces of school library leadership (pp. 1-12). Santa Barbara, CA: Libraries Unlimited. Job-embedded Professional Development: That’s what preservice school principals have been taking away from presentations I have been making at a preservice Professional Development and Supervision course. Thanks to my TWU educational leadership colleague Dr. Teresa Starrett I have had three opportunities in three different semesters to talk with three different classes of principal candidates. In the one-hour workshop, we look at research and standards and most importantly of all, we demonstrate the potential impact of classroom-library collaboration for instruction on students’ learning outcomes and educators’ teaching. Serving in the role of school librarian, I model cooperation and contrast it with a collaborative coplanning session with a classroom teacher. On November 5th, one of the preservice principals role-played a middle school social studies teacher. While we cooperated and collaborated, the class made notes about the benefits to students, educators, or principals. This week, I will post the results for each of these library stakeholders. 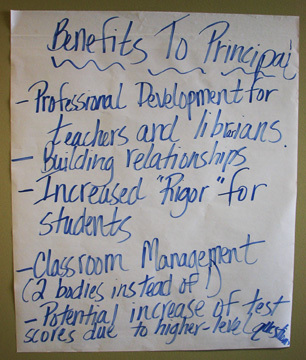 The photo above shows the “benefits to principals” identified by one group. All three times I have offered this workshop, preservice principals have noted “job-embedded professional development” as the number one benefit to principals. Yes, they are in a course in which this aspect of their future jobs is being stressed, but this also shows me that principals are seeking support in this area. To know they have someone in the library who is working closely with all the teachers in the building to improve instructional practices is a godsend. If you are a school librarian, if asked, what would your principal say is your greatest contribution to the learning community in your school and how does your principal benefit from your work?